The picture of scales above shows the current ratio of graduate students (including those enrolled in doctoral course) and teaching staff of the institute. Such 1:1 ratio enables individual approach to be taken with every of our students. You may be worried about progress of your experiment: at IPSR it is very easy to contact your advisor for immediate help. Contact of students and teachers is developed on everyday basis which guaranties smooth progress of every student’s research project. In complement to highly individualized student approach, we adopt a multi-advisory policy for each student: at least one additional faculty member, a recognized specialist in the field, is assigned together with the main supervisor to overlook research progress and guide each student in the best possible way. We care that every student achieves excellent results during his/her study period. A number of foreign students, staff and faculty members from various Asian countries, Europe, Africa and Americas enroll/participate in graduate courses offered at IPSR. Lively international environment is one of the features of everyday life at IPSR, and we are truly proud of it. Our experienced staff, often graduates from recognized foreign universities and/or having postdoctoral research experience abroad, can efficiently assist you after your arrival to Japan. They have had similar experience and memories that strongly resonate with your needs and feelings of being a newcomer in Japan. 3. Top level research at IPSR is a must! The research at IPSR aims to study plant responses under various stress conditions and apply research outputs to industrial level, so that we ultimately contribute to sustainable crop production and non-destructive use of environment. We aim development of low-input crops that will guarantee sustainable food production, even under deteriorated environmental conditions that may occur in the near future. For those particular research challenges and targets in each research group, please click here. All our studies are supported by outstanding equipment at IPSR, research facilities and outreaching genetic resources focused on barley and wild plants. The institute is an integral part of research network that involves 45 national institutes and 36 international research centers in 19 countries! All-in-one IPSR campus is located in the heart of Kurashiki city, in close vicinity of well-known Ohara Museum of Art, and just few steps from historical Bikan-chiku area famous for its ancient history. Despite its urban location, the experimental field of 1.5 ha is available for experiments directly at IPSR campus. Our library is holding a collection of almost 200,000 books and periodicals, RI laboratory, and quarantine greenhouse are available right here on the campus. Large and often costly equipment (such as electron microscope, MALDI TOF mass spectrometer, LC-MS/MS, capillary sequencer, microarray scanner etc.) are managed as common facilities in the institute, available for every researcher and all students associated with the laboratories. Kurashiki IPSR campus is truly independent “all-in-one” campus suited for high level plant research. Close to 20 lectures, workshops, national and international symposia attended by top Japanese and overseas researchers are organized at IPSR every year. Naturally, all events are freely accessible to research staff and students of the institute. IPSR Plant Stress Symposium on topics that cover genetic resources and plants stress is organized every year. IPSR Assemblies of research staff and students are held on regular basis to openly discuss current progress and latest research results in each IPSR group. Journal clubs and seminars are organized in each group to further promote collective learning, communicate about hot research topics and enhance education of students. 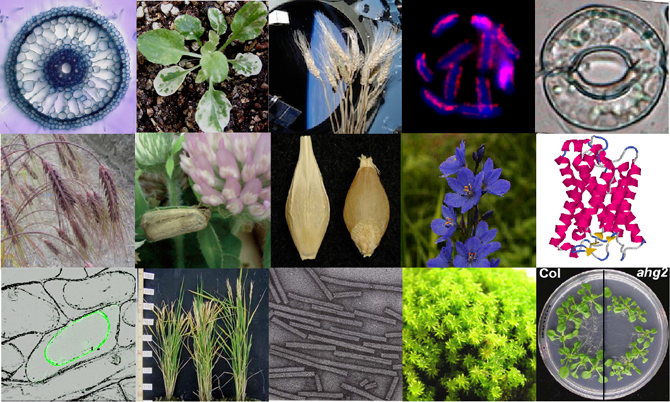 We talk about plant genetics, plant physiology, plant breeding science, plant pathology, taxonomy and many other contemporary life science topics. It is your choice to come and join us! In order to develop “critical thinking skills” as well as “spontaneous communication skills” of each graduate student at IPSR, we offer lectures in special areas of expertise of our faculty staff members, scientists by heart and everyday practice. For example, lectures on presentation of research work at meetings and symposia, and “laboratory manual” of how to conduct research are provided to aid your first steps as a young researcher. In addition, these skills may come handy at your later academic, company and/or private life. Solving problems with confidence and not being afraid of facing difficult challenges will undoubtedly promote your personal and professional life. Come and build your creative abilities up, get inspired here at IPSR, center of excellence in plants stress research and bioresources in Japan!